Every Spring a bunch of us get together for a cowboy gathering and reunion. We meet on the Brazos River in Palo Pinto County. It's a grand time for men and boys. We spend several days ropin' everything on four feet and just being horseback with friends. The whole deal culminates with a worship service under a big live oak tree. A couple of years ago, as our ol' preacher was wrappin' up, he said we needed to head down to the river. One of our men's wife had made a profession of faith on her death bed and when she did her husband stated his faith and asked to be baptized. Upon hearing of this, his son and grandson each professed their faith. That morning we went to the river with three generations in tow and another young man joined in his desire to be baptized as well. As our wet men were coming out of the water, one of our number who is blessed with a most beautiful voice, sang out with "How Great Thou Art". His tribute filled the river bottom as three Canadian geese flew in formation past us, low over the water. 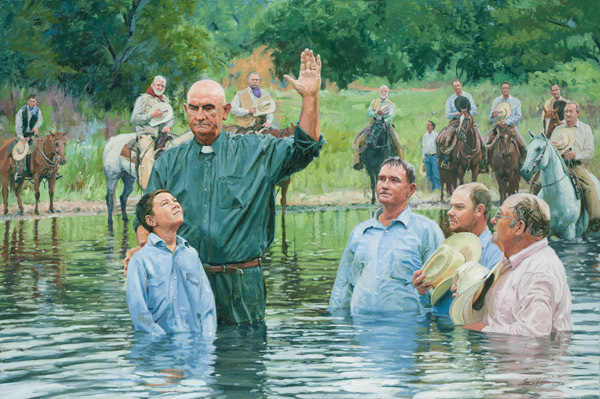 The actual old name of the Brazos River is the Brazos De Dios which means the Arms Of God.